Judges are in a unique position to witness the behavior of lawyers practicing in their court. The Rules of professional conduct require reporting lawyers who are failing to exercise diligence and competence in their practice of law. Failing to raise issues and advance client’s interests as would be expected by competent counsel. Visibly intoxicated or impaired in court or in a deposition, etc. ABA suggests consulting mental health experts or your local State LAP . . . CALL YOUR LAP FOR REFERRAL TO AN EXPERT! In many cases, JLAP receives calls from judges who have become concerned about a lawyer (or even a peer) but by the time behavior had become chronic enough for the judge to reach out to LAP, the underlying damage can already be severe. Subtle declines in diligence and competence should not be taken lightly and could signal severe mental health issues under the surface. It is also difficult to spot alcoholism and addiction in many cases in the legal profession because the lawyer or judge seems to be functioning despite heavy substance use. An “HFA” is an alcoholic who is able to maintain their outside life, including work, academics, daily responsibilities, housing and relationships while still drinking alcoholically. HFAs have the same disease as the stereotypical alcoholic, but it manifests or progresses differently. Many HFAs are not viewed by society as being alcoholic, because they have succeeded and over-achieved throughout their lifetimes. They are often able to hide their addiction so that loved ones and colleagues may not think that they are alcoholic. HFAs may include white-collar workers, blue-collar workers, students and stay-at-home mothers. Typically, HFAs and their loved ones are in complete denial about the drinking problem, because society has led them to believe that, if a person is able to function, then they do not have an alcohol problem. HFAs have the disease of alcoholism: it is a lifelong, chronic, progressive and potentially fatal illness. While HFAs may be succeeding professionally or academically, they may be engaging in dangerous behaviors, such as drinking and driving, having risky sexual encounters, and blacking out, etc. Although they may have been able to avoid serious trouble professionally or personally to a certain point, it is only a matter of time before alcoholism will lead to problems. HFAs are also putting their own health at risk through their alcoholic drinking, and putting the emotional health of their family and loved ones in jeopardy because they are not getting treatment for their alcoholism. Additionally, when people are engaging in active addictions, they have not developed other coping skills to deal with life stressors and are limited in their distress tolerance. One of the biggest fallacies coming to bear in HFA cases is the notion that problem drinking can be contained within one’s personal life and not visit any complications upon their professional life. In the fullness of time, a drinking problem at home will surely impact executive function and begin to degrade professional performance. HFAs can exhibit different characteristics and drinking patterns at different times or phases of their drinking. These may include, but are not limited to, feeling shame and remorse from drunken behavior; having failed attempts to control drinking; being able to abstain from drinking for months or even years; surrounding themselves with others who drink heavily; lacking an interest in or ability to drink in moderation; compulsively finishing alcoholic drinks — even someone else’s; deceiving themselves and/or others about the amount and alcohol content of their drinks; being skilled at living a compartmentalized life in terms of separating their drinking life from their professional life; making excuses for their drinking or using alcohol as a reward for their hard work; setting up their lives in a way that negative feedback from others can be avoided; thinking that drinking expensive alcohol or wine implies they are not alcoholic; hiding alcohol consumption by sneaking alcohol before a social event or drinking alone; drinking despite adverse consequences (either emotional or physical); and experiencing blackouts or memory lapses. 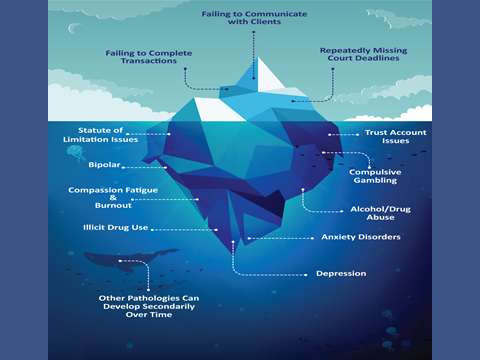 According to the DSM – 5 which is published by the American Psychiatric Association (APA), a substance use disorder is a cluster of cognitive, behavioral, and physiological symptoms. keeps using the substance despite significant substance related problems. Alcohol/Substance is often taken in larger amounts or over a longer period than was intended. 1. Alcohol/Substance is often taken in larger amounts or over a longer period than was intended. 6. Continued alcohol use despite having persistent or recurrent social or interpersonal problems caused or exacerbated by the effects of alcohol. 9. Alcohol use is continued despite knowledge of having a persistent or recurrent physical or psychological problem that is likely to have been caused or exacerbated by alcohol/substance use. 10. Tolerance, as defined by either of the following: a need for markedly increased amounts of alcohol/substance to achieve intoxication or desired effect or a markedly diminished effect with continued use of the same amount of alcohol/substance. 11. Withdrawal, as manifested by either of the following: withdrawal syndrome or alcohol/substance is taken to relieve or avoid withdrawal symptoms. The severity of the substance use disorder (SUD) is indicated by the number of criteria endorsed. “This Rule does not require disclosure of information otherwise protected by Rule 1.6 or information gained by a lawyer or judge while participating in an approved lawyers assistance program. R.S. 37:221 and Rule 8.3(c) work in unison to promote early intervention and encourage impaired legal professionals to seek help from their State LAPs. Due to the unique position of power and influence that a judge holds in the legal profession, it is often a judge (or group of judges) that can exert the leverage necessary in an intervention to cause the person to surrender and agree to accept JLAP-approved help. A call to JLAP can begin the process of determining whether or not behavior is a concern, whether or not an intervention is appropriate, and actually designing and conducting a professional intervention if need be. By calling JLAP, Judges can help save the lives and careers of impaired lawyers who appear before them.